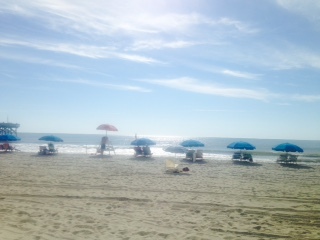 I was excited about fall’s arrival, but I had to make a trip to the beach before summer’s end. One of the perks of living in Columbia is you can get to a beach within two to three hours. 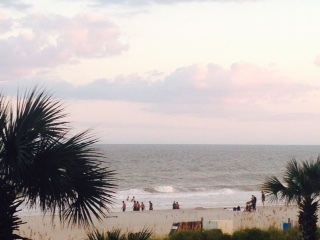 I chose Myrtle Beach for my final summer hurrah. It’s familiar territory and there are plenty of things to do while you’re there. Since it was near the end of September and a few weeks past Labor Day, I figured there would be fewer beachgoers, but not so. It was in the upper 80s and beach fun was still in high gear! Why are families still vacationing? Isn’t school back in? Those were two questions I asked while people watching as we scrolled down Ocean Boulevard trying to find a place to lay our heads. No vacancy. No vacancy. No vacancy. We saw those two words in lights for miles. Again, I didn’t think Myrtle Beach would be flooded with tourists at the end of September; therefore, I didn’t make it a priority to make reservations. After about two hours, we finally found a place where we were willing to stay. But wait, it was just for one night. There was no availability for Saturday night. That’s okay, one night at a time. At that moment I was just ready to rest. Saturday morning we made a quick trip to the outlets. I thought it was quick; my husband might beg to differ. Next stop was Broadway Grand Prix because I was ready to speed things up and run circles around my husband on the tracks. I also took a swing at whipping him in mini golf. 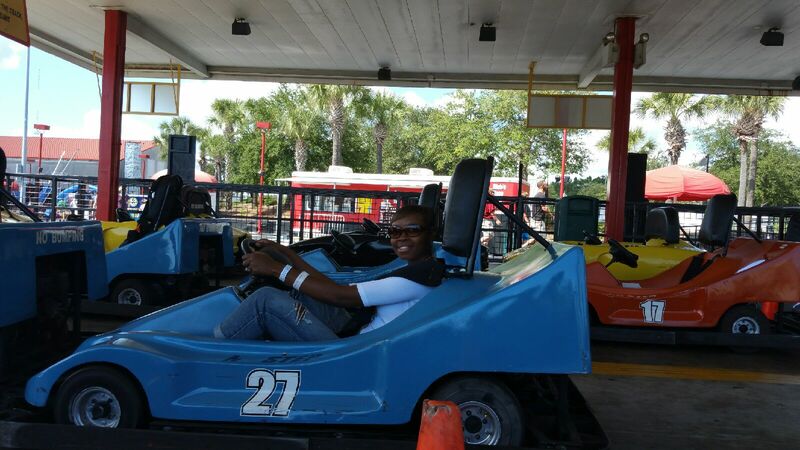 For 20 bucks we got to act like big kids and drive go carts. Then we played putt-putt. I confess: I lost! I lost on the track and the green. But I had fun and that’s a win for me! 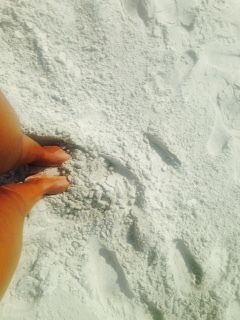 My whole purpose of visiting the Grand Strand was to put my feet in the sand and make a splash. So our next stop was the beach where we could see hundreds of sunbathers soaking up the sun, kids frolicking in the water, couples enjoying a beach walk and people collecting sea shells. I never stay in the water long. 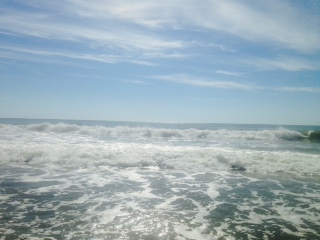 It probably takes me longer to immerse my body all the way in than the time I spend fighting the waves. That’s because I’m trying to get used to the cold water. Thank goodness for a warm pool and a Jacuzzi. I think I spent more time there. By the way, finding an oceanfront room on Saturday was painless. After all that time in the water (and heat), I was ready to fill up on crab legs. All I needed to find was an all-you-can eat restaurant with crab legs on the bar. I was in seafood heaven when we arrived at Bennett’s Calabash Seafood Buffet. I don’t know how many trips I made to the buffet. I wasn’t counting. I will tell you that I ate my money’s worth. Nom nom! It’s always sad to see the last day of vacation or a weekend getaway come to an end. More memories were made and more stress was released. I look forward to seeing ol’ Myrtle again. This entry was posted in Chaunte McClure and tagged Chaunte McClure, every woman blog, Famously Hot, lexington medical center., Myrtle Beach, South Carolina by lexingtonmedicalcenter. Bookmark the permalink.